3 Bedroom Detached House For Sale in Marlborough for Guide Price £525,000. 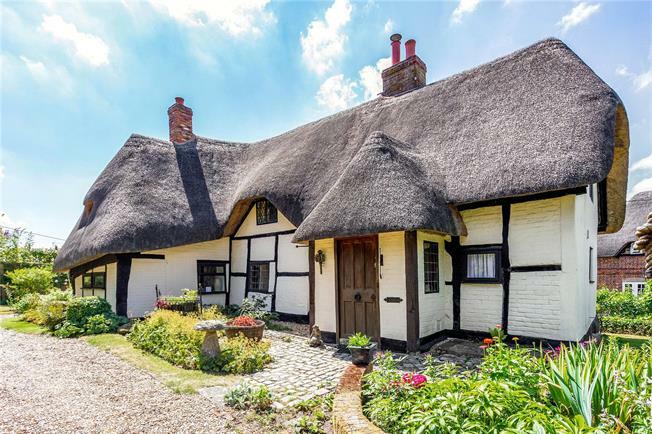 This truly enchanting Grade II listed detached cottage offers delightful and well presented accommodation with an abundance of character and period charm. The cottage is believed to date back to early 17th century and has many original features such as exposed beams, inglenook fireplace and floorboards and has been well looked after by the current owner. A welcoming porch leads to the entrance hall with mellow brick flooring which in turn leads to a delightful study/library with built in book shelves. The sitting room is an elegant double aspect room and features a large inglenook fireplace fitted with a wood burning stove, a beautiful oak door leads into a spacious dining room, this lovely room has panelled walls and exposed beams and has an open fireplace and opens into the kitchen. The kitchen is a triple aspect light room, with an attractive outlook over the garden and has a good range of cupboards and is fitted with double oven, ceramic hob and integral fridge, freezer and dish washer. The plumbing for the washing machine is in a very useful garden room with a door to the outside. upstairs there are three double bedrooms, the master bedroom has a beautifully quirky ensuite shower room. The market town of Marlborough (6 miles) is famous for its wide high street and offers an extensive range of facilities with a large number of specialist shops, pubs and restaurants. There are nearby railway stations to Paddington London at Pewsey or Great Bedwyn and to Waterloo Station from Andover. Junction 14 of the M4 is about 12 miles to the northeast. A gravel drive leads to parking for several vehicles and the cottage has had planning permission (now lapsed) for a timber framed double garage. There is also a large timber shed. The garden is absolutely stunning and a real feature of the cottage. Immediately adjoining the cottage is a charming sun terrace, ideal for outside eating. The garden is laid to lawn with wide well stocked flower borders and variety of specimen trees and shrubs and a small pond. There is a greenhouse with kitchen garden area. The cottage has historic and now lapsed planning permission (no K/21410) for a timber framed double garage.